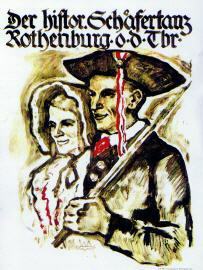 The Shepherd´s Dance was recived in 1911 , and performed regulary since then for the guests of the City of Rothenburg. It consists of several dance figures which, together with the 19th century costumes of the maids, as well as the ribbons on the lad´s traditional shovels, create a colorful and impressionable presentation. Then come and see us-we are anxious to meet you! Der Kirchenbau von innerhalb der Stadtmauer fotografiert. Sheep farming and the wool trade played a central role in the economy of medival Rothenburg. The shepherds banded together in a brotherhood. At a shrine in front of the Klingen Gate, they worshiped St. Wolfgang, the patron saint of the herds. 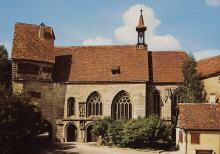 Between 1475 and 1492, a small, attractive fortified church was built on this site. Today, this unique church can be seen in original and unspoilt condition. From outside the gate, it is a defiant fortification with thick walls and embrasures (with casemates behind them, as wells as dungeons and gun emplacematents) on the inside, it is a fine church with artistic late-Gothic tracery and three very beautiful altares dating back to approx. St. Wolfgang´s altar (1500, high altar) with the wooden figures of St. Sebastian, St. Wolfgang and St. Rochus, as well scenes from the Wolfgang legend. St. Wendelin´s altar with depictions of St. Wendelin, St. Martin, the Holy Emperor Heinrich II. and St. Nicolaus. The Lady altar with pictorial resentations from the legend of the Holy Emperor Heinrich II. and the St. Nicolaus. 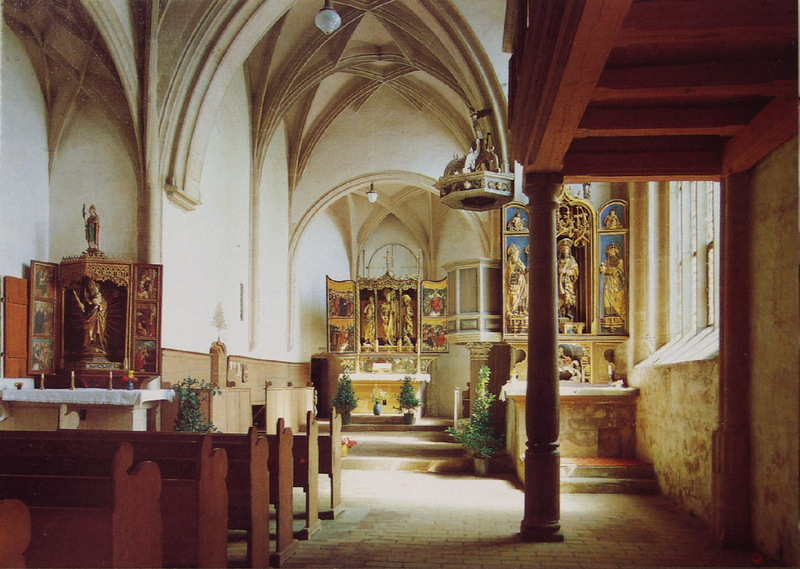 The church was given the name „Shepherd´s Church" because the members of the brotherhood of shepherds held their service of thanksgiving every Year on the Tuesday after St. Bartholomew´s Day. After the service, the shepherds proceeded to the „Lamb Inn" at the Market Place to eat, drink and dance. The custom of the shepherd´s dance was recieved in 1911. Since then, the dance has been performed several times a year at the historical market place. In 1986, the Shepherd´s Dance Exhibition was opened in the gate house of St. Wolfgang´s Church. The exhibition presents items of interest connected with sheep farming and the Shepherd´s Dance in Rothenburg ob der Tauber. You can buy tickets at the maktet square before the dance starts.